The folks over at #desklets have been making some progress on their hack for week. Andreia wrote an SVG to XAML conversion tool that is very handy to import artwork from tools like Inkscape into XAML. mopen can launch multiple applications into the same Mono virtual machine and isolate each desklet from each other using Application Domains. This feature is important to us because it means that only one Mono Virtual Machine, Gtk# and Moonlight are loaded at a given time to run multiple applications at the same time. 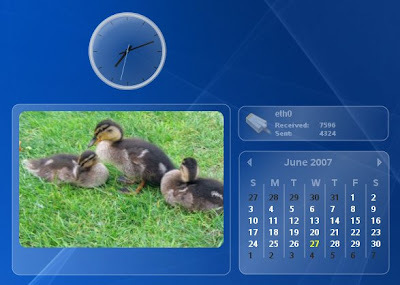 Security System: today deskltes run without a security sandbox. We will be working on the Silverlight security system for Mono. Once that is implemented users will be able to run untrusted code into the sandboxed environment. The new Silverlight security system is a lot easier to understand than the old CAS, so we are looking forward to implement this (it is also a requirement for the Moonlight browser plugin). Mono: we get to leverage our favorite CLI-based languages (C#, Boo, IronPython, Nemerle or any other language that targets the CLI) and we get to leverage the CLI APIs. Desklets are of course not a new thing, Google and Yahoo both ship desklet systems. 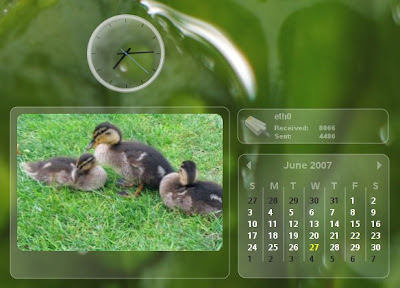 OSX and Vista have widgets and gadgets as well. Gnome has gDesklets, KDE has SuperKaramba. This is merely our take on the challenge as part of Novell's hack week and it is also a good way of exercising our Moonlight engine, the Gtk# binding, Mono and try to learn something new in the process. If you have not seen them, you should check out what other folks at Novell are doing during their hack week. There are some videos here. Today it seems to be strongly slanted towards Evolution and panel applets.